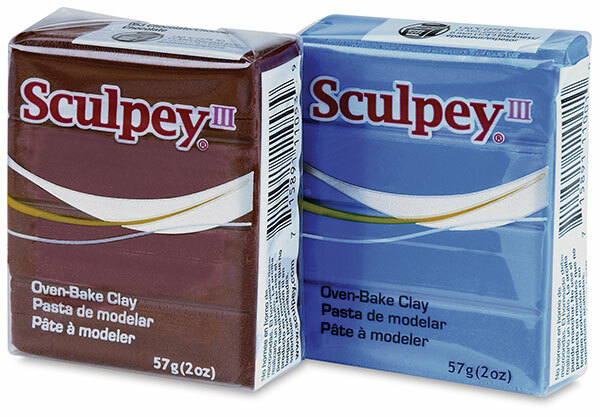 Sculpey III has the same excellent handling qualities as regular Sculpey, only it's softer and more pliable, making it easy to condition. It bakes to hardness in the oven at 275°F (130°C) for 15 minutes per ¼" (6 mm) thickness. It requires no painting. Individual colors are sold in 2 oz (57 g) blocks. Bright Ideas Set — Contains 10 blocks, 2 oz (57 g) each. Granny Smith, Hot pink, Fuschia Pearl, Just Orange, Violet, Turquoise, White, Purple, Yellow, Red Hot Red. Classic Collection Set — Contains 10 blocks, 2 oz (57 g) each. White, Black, Chocolate, Blue, Yellow, Red, Beige, Emerald, Purple, and Just Orange. Naturals Set — Contains 10 blocks, 2 oz (57 g) each. White, Moss, Beige, Sweet Potato, Elephant Gray, Suede Brown, Hazelnut, Tan, Black, and Red. 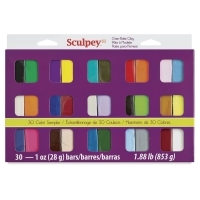 30-Color Sampler — Contains 30 assorted Sculpey III colors in 1 oz (28 g) blocks. The Sampler Set is a great way to try out a variety of colors without buying larger blocks. Colors include Black, Emerald, Violet, Yellow, Camouflage, Red Hot Red, Just Orange, Ballerina, Gentle Plum, Light Blue Pearl, Translucent, Sweet Potato, Blue, Deep Red Pearl, Pearl, Spring Lilac, Suede Brown, Granny Smith, Gold, Lemonade, Hot Pink, Chocolate, Beige, Turquoise, Leaf Green, Sky Blue, Silver, Red, White, and Teal Pearl. With so many Sculpey clays available it is hard to know which to choose. This video explains the difference among all the Sculpey "foundation" polymer clays, such as Original Sculpey, Sculpey III, Premo Sculpey, Super Sculpey and Super Sculpey Firm. Learn about the unique attributes of each — so you know exactly which product to select for your next polymer clay project. When beginning with polymer clay, there are some important basic guidelines you should know in order to have successful results. This video tells you everything you need to know about conditioning methods, work surfaces and clean up when working with Sculpey Polymer Clay. Have you ever seen those complicated and intricate polymer canes and thought you'd like to be able to create them yourself? We will show you how to start at the beginning making simple canes, and then combining them to create complex canes. For great tips and techniques, don't miss this video! The Skinner Blend allows you to create a single sheet of polymer clay containing beautiful gradation of color. These sheets can then be incorporated into any project. This technique is fun and easy — with amazing results! You can use any Sculpey polymer clay. Mokume Gane is a Japanese method of manipulating metal to achieve a wood grain appearance. Polymer clay artists have borrowed from this art form to create magnificent patterns. The results are beautiful and impressive — and it's easier to make than you might think. We'll show you three techniques and ideas of what you can create using these incredible designs.